Not symphonic music, but rather the shattering roar of cannon announced the birth of Richard Wagner on May 22, 1813 in Leipzig. The German kingdom of Saxony had been overrun by the French troops of Napoleon Bonaparte as he made a last-ditch effort to reassert dominance over Europe. Since the Treaty of Posen was signed in December 1806, Saxony had been one of several German principalities reorganized by Napoleon into the new Rheinbund or Confederation of the Rhine. Kings and princes offered Napoleon “tribute” in the form of money, men, and equipment. In the summer of 1812 Napoleon rode across Germany, its undisputed master, en route to Russia. By autumn the Grande Armée felt the pain of defeat. Napoleon lost over 400,000 men in the Russian snow and was forced to retreat back across Europe. Napoleon was not yet finished however. In March 1813, French soldiers advanced toward the Elbe River. The main action of this new campaign occurred in Saxony, which Napoleon planned to use as a base for his immediate goal – the capture of Berlin. Although other German rulers were anxious to avenge the years of French oppression, the King of Saxony never wavered in his support of Napoleon. He sent what was left of his army to fight side by side with the French helping them to win the battles of Lützen and Bautzen in May. In October Leipzig was the scene for the Völkerschlacht or “Battle of the Nations” when Napoleon was defeated by the combined forces of Russia, Austria, Prussia, and Sweden. Saxon troops, betraying their king, besieged within the city by the Allies, deserted both him and Napoleon, whose vanquished forces were soon fleeing toward Mainz and the borders of France itself. The First French Empire was crumbling, and within half a year Paris too would fall. Richard Wagner’s father, Karl Friedrich, was the registrar of police in Leipzig. Exhausted by an overwhelming number of official duties resulting from the military campaign, he was especially vulnerable to an epidemic of typhus that flared as a result of corpses lying unburied in the streets. He died six months after Richard’s birth on November 23, 1813. The mutiny of King Friedrich’s troops exemplified popular Saxon feeling. The French were detested, and stories of Napoleon’s treatment of Germany were most certainly heard by the young impressionable Richard. 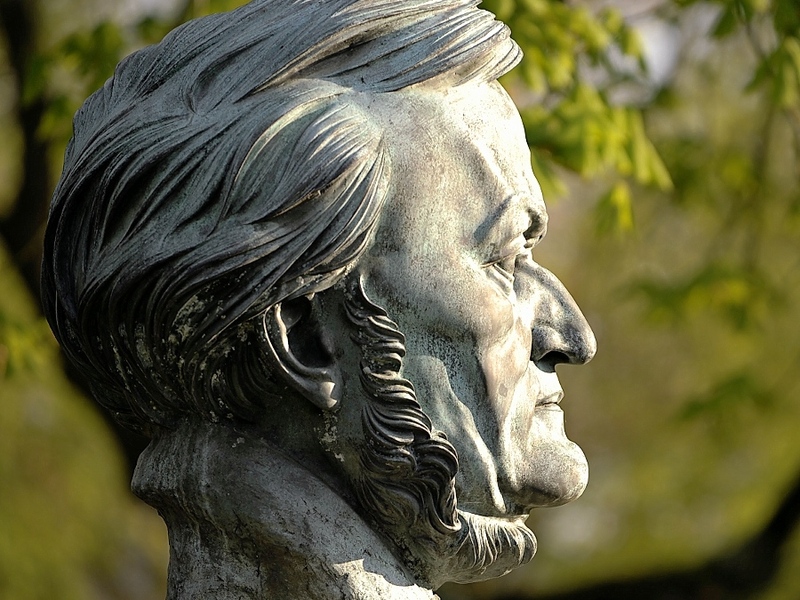 Richard Wagner is best known for his massive “music dramas” that still captivate large audiences whenever they are performed in the world’s greatest opera houses. In addition to his fantastic musical landscapes, Wagner commented and philosophized on many subjects throughout his lifetime. From musical concerns and art to Judaism and race, Wagner was never shy to opine. Wagner’s comments on the subject of military conflict not only provide a glimpse into his political thought which began to take form from the time of the Dresden Revolution in 1849, but also provide us with insight into what his views might have been during the Twentieth Century’s two great cataclysms. There were four wars involving German states during Wagner’s lifetime. The first war was the previously noted Napoleonic War. Wagner was only an infant and his subsequent recorded comments are very limited. In 1864, the Prussian-Danish war would be fought likewise with little comment from Wagner who was busy with various personal matters. In April of 1866, a few months before the Austro-Prussian war broke out on June 14, Wagner denigrated Bismarck as “an Ambitious Junker [who] betrays his imbecile of a King [Wilhelm I of Prussia] in the most brazen manner.” The outcome of the war, however, caused many Germans, including Wagner, to revise their opinion of Bismarck. Bavaria joined the other states in the German Confederation in supporting Austria, but with Prussia’s decisive victory in July, the Confederation disintegrated and all eyes turned to Bismarck as the builder of a new German nation-state. His leadership qualities commanded respect and many believed that he had opened the way to the long-sought national unification. It was at this time that Wagner was still completing his magnum opus, Der Ring des Nibelungen. Wagner’s slow progress can be attributed to the shadow of war as well as the birth of his son Siegfried on June 6, 1869. The Franco-Prussian war which finally broke out in July 1870 with Bavaria siding with Prussia, was fought against a background of rising national pride in Germany. The partisan attitude of Wagner and his mistress and future wife Cosima reflected the prevalent sentiment among Germans. Cosima’s frequent diary entries regarding the Franco-Prussian war provide researchers with wonderful insight into Wagner’s views on the conflict. In July of 1870, Spain was looking for a new monarch. Leopold, the hereditary prince of Hohenzollern-Sigmaringen, was one of the possible candidates for the throne. Bismarck saw the obvious advantages of such a link with Spain. He wrote to Charles Antony, Leopold’s father, showing the vital service that could be rendered to Germany through the acceptance of the throne. Leopold gave in to Bismarck’s arguments. Bismarck had certainly hoped that the election would be concluded before Napoleon III could do anything. France, feeling insulted, instructed the Ambassador to Berlin to demand that the Prussian government not approve of Leopold’s acceptance of the Spanish crown and that the Prussian King, Wilhelm I, order him to withdraw. The arrogant and wicked French are not content with the withdrawal of the Prince of Hohenzollern, they are demanding through their envoy Benedetti a promise from the King of Prussia that he will never give his approval to the acceptance of the Spanish crown by any Prussian prince. The King quite rightly refuses to receive the envoy. So now they are arming! This news upsets us greatly. Wagner was completely content with Prussia’s representation of Germany as a whole. There is little doubt that Cosima’s thoughts mirror those of Wagner; she writes on July 17 of her “complete sympathy with Prussia.” Richard and Cosima were completely disgusted with the French. Wagner said, “The French are the putrefaction of the Renaissance.” Wagner actually demanded that his friends understand how much he and Cosima hated the French character. Cosima made a typical entry on July 18 regarding the French behavior. The more one hears of the French behavior, the more angry one becomes; a tissue of lies, ignorance, insolence, and conceit. As reason for the war Gramont and Ollivier cite the memorandum which Bismarck is said to have circulated to all foreign courts. There never was such a note — just the telegram which was published in the newspapers, and so it is all pure lies. The newspapers report some splendid revelations by Bismarck; he has had the Times informed of the proposals which Benedetti unceasingly made to him (French invasion of Austria, so that they might then conquer Belgium, then supplies for the Southern states, enabling them to take over French Switzerland, and other savory things of that sort). The French do not know what to say, except that the Emperor knew nothing about it, or that Bismarck had provoked it all. By July 31, Cosima recorded Wagner’s increasingly negative views of the French, “France needs a Moltke cure,” of course referring to the Chief of the Prussian General Staff, Graf Helmuth Carl Bernard von Moltke. By August 4, Wagner’s anti-French tone would switch to a pro-Bismarck, pro-unified Germany tone. Ever-mounting pleasure in Bismarck, whose revelations show ever more clearly how wisely and at the same time how righteously he has been acting; he says he did in fact have to temporize with the French in order to enjoy at least a few years of peace. He has also forced England, by casting ceaseless aspersions on its actions, to stop supplying France with coal and ammunition — How uplifting it must be for Bavaria, Saxony, and Württemberg to be fighting now as a German army! Not unlike the great wars of the 20th century, propaganda was widely used by both sides during the Franco-Prussian War. Richard’s and Cosima’s acceptance of the German perspective and categorical dismissal of French propaganda is important, not only in order to better understand their position on the Franco-Prussian war but to provide insight into what their opinions might have been on the two world wars that Germany fought against France in the 60 years following Richard’s death. Cosima’s diary entries continue with numerous accounts of atrocities as carried out by the French. Our troops are advancing ever farther, God be with them, We read the most frightful accounts of the inhumanity of the French, wounded men and doctors are being murdered, one of the former had his eyes gouged out by a 14-year-old boy! It is terrible. R. says he hopes Paris will be burned down — the burning of Paris would be a symbol of the world’s liberation at last from the pressure of all that is bad. R. would like to write to Bismarck, requesting him to shoot all of Paris down. Discussion of the situation, R. believes the German reports implicitly. On August 24, the day before their marriage, Cosima took the time to make the following entry, condemning the lies spread by the enemy newspapers. The French newspapers continue to spread lies, they say that the Germans maltreat the wounded and that they seize all the young French people and force them to fight in the front line; these lies are responsible for all the terrible reprisals practiced by the French. Finally, with the defeat and surrender of the French, the newly married Wagners would rejoice; taking the victory personally. In the following entry, the French capitulation is viewed as a christening present for their son, Siegfried. Unlike the subsequent two wars that would pit the French against the Germans, the British did not intervene on the side of the French. Bismarck’s publishing of Napoleon III’s proposal for France to be given Belgium was enough to swing the British to a neutral if not Prussian position on the war. Similarly, the publication of Napoleon III’s request for a slice of West German territory also sufficed to rally South Germany behind Prussia. In January of 1871, the German princes proclaimed the Second Reich; Wilhelm I of Prussia became the Kaiser on January 18, 1871. Ten days later the armistice was signed between France and Prussia at Versailles Palace. Bismarck achieved his great object of unifying the German peoples, with the notable exception of Austria, in six short years. Bismarck was now able to annex the provinces of Alsace and Lorraine, which had originally been German and whose inhabitants were of mixed German and French stock and language. In fifty short years, Alsace and Lorraine would be lost to France as part of the vindictive Treaty of Versailles. Wagner’s politics strongly supported the new German Reich during this period and manifested itself in a number of lesser-known works. In January 1871, Wagner composed a short five-stanza poem entitled, “An das deutsche Heer vor Paris” (To the German Army before Paris) which celebrated German military conquest and the new Reich. of threat’ning arrogance o’er there to end him. our Germany alone breeds men not women. Wagner sent his poem to Bismarck at Versailles, who replied with congratulations on Wagner’s artistic triumph over the Parisians. April of 1871 brought the first performance of the Kaisermarsch written to celebrate the coronation of Wilhelm I, a work that Wagner hoped would become a new national anthem. Wagner portrays Victor Hugo constantly popping up from the sewers of France, an obvious stab at Les Misérables. Hugo exclaims, “I am here, not through the Prussian ranks, but underneath them.” Hugo’s slithering through the bowels of Paris renders him “matter for 120 volumes.” Images of the “Holy guillotine,” and only those in the sewers finding anything to eat, Paris was undergoing a terrible shortage of food at the time. The Chorus of the National Guard sings “Republic! Republic! Republic-blic-blic!” to the strains of the can-can. The total decay and lack of values, the constant babblings of atheists and revolutionaries paint the absurd canvas. Amidst this chaos Wagner brings rats to the stage. When the cry goes up that “The city is starving” the chorus breaks into, “Rats with sauces, sauces with rats! Here, pass them, or hunger will dine off our hats!” Finally the rats metamorphose into Ladies of the French Ballet. Evil deeds threaten us; once the German realm and its people fall under false foreign rule, soon no king will understand his people, and they will sow the seeds of deception and falsehood in our German lands; what is German and true will no longer be known, unless it lives in the honor of the German Mastersingers. Wagner’s attack on alien influence on German culture and art would eventually carry over to biological issues. His final prose works would address this theme often. The theme of racial decay would be carried on in the works of Houston Stewart Chamberlain, Alfred Rosenberg, and Adolf Hitler. Wagner died on February 13, 1883, six years before the birth of his most infamous admirer. Today Wagner is widely denounced as the spiritual father of both National Socialism and Adolf Hitler. Some 60 years after Wagner’s death, the impact of Hitler and World War Two on Wagner’s reputation cannot be overlooked. While many contemporary Wagnerians prefer to dissociate Wagner completely from this time, it is his greatest critics who may be closest to the truth. I shall never disavow my friendship with [Hitler]; I cannot do it . . . I am able, I mean, perhaps no one understands, but I am able completely to separate the Hitler I knew from what he is accused of these days . . . The part of him I know, so to speak, I treasure as much today as before. If Hitler came in the door today, for example, I would be just as pleased and happy as ever to see him and to have him here. The American occupying authorities violated German law by ignoring the clause in Siegfried Wagner’s will which insisted that the Festspielhaus be reserved exclusively for his father’s works. Wagner’s Festspielhaus, a lasting monument to the pinnacle of Western art and culture, was turned into an American soldiers’ dive and space was allotted for an All-Girl Revue. After the crudeness of the “All-Girl Revue” foreign operas such as La Traviata and Madame Butterfly were performed on Wagner’s stage. It was apparent that the Allies did not care much for German honor, art, or values; if they cared at all, it was only to defile them. At the time the idea even surfaced to convert the Festspielhaus into a theater reserved only for the music of composers who had been persecuted by Hitler’s National Socialist regime. This was a new Bayreuth for a new Germany. No longer would Wagner’s works be representative of German honor, art, and values but rather of a timeless, nationless psychological and symbolic world. Today the denigration of true German honor, art, and values is widespread as is the more generalized attack on the honor, art, and values of the West. For those who choose to defend it, Wagner’s admonition, Nicht kapitulirt! should never be forgotten. In fact, it should become a rallying cry. Robert W. Gutman, Richard Wagner: The Man, His Mind, and His Music (New York: Harcourt Brace Jovanovich, 1968), 1. Robert L. Jacobs, Wagner (London: J. M. Dent & Sons Ltd., 1980), 1. The Prussian-Danish War was the second military conflict resulting from the Schleswig-Holstein Question. It began on February 1, 1864, when Prussian forces crossed the border into Schleswig. Denmark fought the combined armies of Prussia and Austria. In 1864 Wagner was working on his massive Die Meistersinger von Nürnberg. At the time he was living in his home Triebschen near Lucerne, Switzerland as he was still an outcast of Germany due to his role in the revolution of 1849. Also in 1864, the Vienna production of Tristan und Isolde was abandoned after 77 rehearsals and deemed impossible to perform. Stewart Spencer and Barry, Selected Letters of Richard Wagner (New York: W. W. Norton & Company, 1988), 593. Cosima Wagner (December 24, 1837–April 1, 1930) was born Cosima Liszt. She was the daughter of the renowned pianist and composer Franz Liszt. In 1857 she married Wagner’s friend and conductor Hans von Bülow. After giving birth to three children fathered by Wagner — Isolde, Eva, and Siegfried — she and von Bulow would finally divorce. Wagner and Cosima were married at Lucerne, on August 25, 1870. For more on Cosima Wagner see George R. Marek, Cosima Wagner (London: Julia MacRae Books, 1981). Cosima Wagner, Cosima Wagner’s Diaries, Volume I: 1867–1877, trans. Geoffrey Skelton (New York: Harcourt Brace Jovanovich, 1976), 243. Michael Howard, The Franco-Prussian War: The German Invasion of France, 1870–1871 (New York: Dorsett Press, 1961), 49. Cosima Wagner, Op. Cit., 244. Cosima Wagner, Op. Cit., 245. Ibid., 250. Helmuth Karl Bernhard Graf von Moltke (October 26, 1800–April 24,1891) was a German Field Marshal. Von Moltke served as the chief of staff of the Prussian Army for thirty years. He is widely acknowledged as one of the greatest strategists of the 19th century, and an innovator in methods of directing armies in the field. Wagner’s son Siegfried (June 6, 1869–August 4, 1930) was a composer and a conductor. He served as artistic director of the Bayreuth Festival from 1908 until his death in 1930. During the summer of 1923, Siegfried was in Munich to conduct a concert that was cancelled due to Hitler’s Putsch. Siegfried and his wife Winifred were horrified as they witnessed Hitler, Ludendorff, and Göring being fired upon by soldiers of the Bavarian government. Russell Grenfell, Unconditional Hatred: German War Guilt and the Future of Europe (New York: Devin-Adair Company, 1954), 53. Richard Wagner, “To the German Army before Paris,” Richard Wagner’s Prose Works, Volume V, Actors and Singers, trans. William Ashton Ellis (New York: Broude Brothers, 1966), 2. David C. Large, “Wagner’s Bayreuth Disciples” in Wagnerism in European Culture and Politics (Ithaca, New York: Cornell University Press, 1984), 75. Richard Wagner, “A Capitulation” (Eine Kapitulation), Richard Wagner’s Prose Works, Volume V, Actors and Singers, trans. William Ashton Ellis (New York: Broude Brothers, 1966), 5. John Deathridge and Carl Dahlhaus, The New Grove Wagner (New York: W. W. Norton & Company, 1984), 175. Richard Wagner, “A Capitulation,” Op. Cit., 33. Bayreuth is a town in northern Bavaria, Germany in which Richard Wagner made his home from 1874 until his death. Wagner’s house, Wahnfried, was constructed from 1872 to 1874 and has served as a museum since 1976. Since 1876 the Bayreuth Festspielhaus, which was constructed for the sole purpose of performing Wagner’s music-dramas, has been the location for a near-annual festival of Wagner’s music. See especially Houston Stewart Chamberlain, The Foundations of the Nineteenth Century, trans. John Lees (New York: John Lane Company, 1912); Alfred Rosenberg, The Myth of the Twentieth Century: An Evaluation of the Spiritual-Intellectual Confrontations of Our Age, trans. Vivian Bird (Newport Beach, California: The Noontide Press, 1993); and Adolf Hitler, Mein Kampf, trans. James Murphy (London: Hurst and Blackett, 1939). Geoffrey G. Field, Evangelist of Race: The Germanic Vision of Houston Stewart Chamberlain (New York: Columbia University Press, 1981), 365. Chamberlain published numerous articles and pamphlets justifying the war as a selfless cultural crusade. These were printed and distributed to hundreds of thousands of German soldiers. In 1916, Chamberlain renounced his British citizenship and officially become a Bavarian subject. Frederic Spotts, Bayreuth: A History of the Wagner Festival (New Haven, Connecticut: Yale University Press, 1994), 203. Martin van Amerongen, Wagner: A Case History (London: J. M. Dent and Sons, 1983), 5. Published: May 21, 2013 | This entry was posted in North American New Right and tagged articles, France, Franco-Prussian War, Germany, North American New Right, originals, Richard Wagner, Richard Widmann, Wagner Bicentennial Symposium, war. Both comments and trackbacks are currently closed. 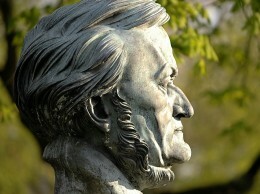 Well, today, 22 May 2013, is Richard Wagner’s 200th birthday! !